​​​ “I’m not living in the past—I’m too interested in today!” said Joan Crawford. ​I had asked her to go with me to a recent showing at the Museum of Modern Art in New York of THE HOLLYWOOD REVUE OF 1929, the film in which she made her talking picture debut. It was being shown again for the first time in over 30 years and I thought it might interest her. But she declined graciously, pleading another engagement, just as she had done on another occasion when I mentioned an early film of hers. “I’m not too concerned about the past anyway,” she added. And the lady means it. ​She’s enjoying today and is eager for tomorrow. Her crowded schedule of daily business and social activities, her regular public relations tours for Pepsi-Cola and her frequent appearances on TV talk shows keep her very much a part of today’s scene. Yet the past is always there. 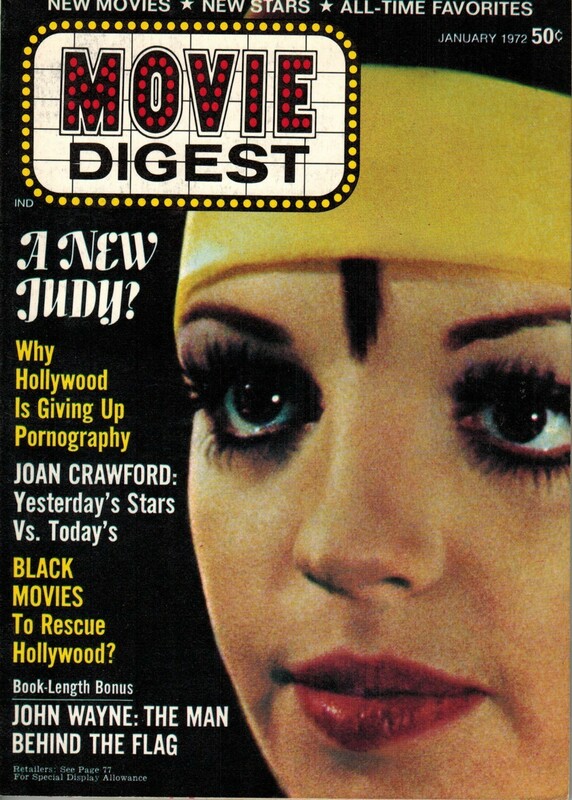 And anyone who has been such an integral part of the film industry for 45 years, and anyone with the remarkable retentive memory of Joan Crawford, cannot help intermingling references to it with the present in her conversation. Even in a fast 5-minute phone chat, the juxtaposition of time reference will be remarkable. Joan has been interested and helpful in a current project of mine, and this has resulted in many meetings and conversations. ​Always, I have found her relaxed and easy to be with, generous and thoughtful, and very humorous-particularly about herself. This side of Joan’s personality is one that some people don’t have the opportunity to see, which is deplorable, since her sense of humor is such a delightful part of her. I wish that some astute producer would cast her again in a screen role in which it could be displayed properly. She used to play such roles early in her career and it would be a treat to see her do it again. Let me tell you of a visit with her this past week. I had phoned to ask if I could come by and interview her for this article. She met me at the door, offered her cheek to be kissed, and introduced me to two friends of hers that were there, Bob Ferguson, an executive with Columbia Pictures, and Mrs. Mary Jane Raphael of Pepsi-Cola. An associate of mine, Maurice (Bud) Goodman, a TV advertising account executive, was with me. ​Princess, Joan’s new five-month-old poodle, barked an enthusiastic welcome. Joan makes everyone very comfortable: she’s a gracious hostess and her spacious apartment, with its profusion of books, paintings, flowers and photographs, is a cool retreat after New York’s late summer heat. ​After she had fixed us refreshments and had served some delicious hor d’oeuvres (caviar, baked ham, creamed cheese and scallions), I asked Joan if she had seen a quote of Darryl F. Zanuck’s in a national weekly in which he said that he does not predict long professional lives for newcomers in films who are taking the star’s places. “They may have luster while they last but they’re not going to shine for long. Some will hit three or four times, then never be seen again,” the noted showman predicted. ​You’re a real ‘Star’ only when your career has lasted for some years and your name will still pull in an audience at the box office. When you can do it after thirty-five years, then you’re really a ‘Star.’ So, I don’t call them ‘Stars,’ I call them ‘personalities." I asked her about some of the young personalities now in films and on TV: who does she like? Who does she think might last? “I’m forever being asked those questions wherever I go on my Pepsi tours, and they’re tough questions to answer fairly. How accurately can you judge someone from a few performances? I try to see all the films my schedule allows and sometimes when I’m able, I relax in the evening after a hard day’s work by watching TV. “There are some fine young talents who’ve come along on TV. Last night I saw Michael Sarrazin and was very impressed with him. He’s just great, with such authority that his talent lights up the screen. And I like the young players on THE INTERNS. Hal Frederick gave a beautiful performance the other evening. ​It must be very helpful to work with a real pro like Broderick Crawford who can do more with just a glance than some actors with a whole monologue. ​He had a scene in which he was entirely in profile but you knew exactly what he was thinking. He didn’t have to say anything, it was all in his attitude. “Lesley Warren of MISSION: IMPOSSIBLE has tremendous potential, and Sheila Larkin of MEN AT LAW has a special kind of talent. ​Zalman King of THE YOUNG LAWYERS is a very talented and intense young actor. Hal Holbrook of THE BOLD ONES is one of our great stars. ​He is but sensational-and we’re going to miss him and his episodes on that show. I wrote him a letter to tell him that. “On three top shows, BONANZA, FAMILY AFFAIR and MARCUS WELBY M.D., the young players have the benefit of working with veterans who can show them so much-the way we used to have at Metro when I was there. Michael Landon has had Lorne Greene on BONANZA. Landon can do no wrong as far as I’m concerned. He’s not only a great actor but a fine writer and a beautiful director-a three-way guy with such talent. I’d love to work with him sometime! Then the question was asked: would the superstars of yesterday, the Gables, the Tracys, or Garbo, for example, make it in today’s market without the buildup and guidance they were given by the big studios? We had an animated discussion then of the behavior of performers during the last decade, the alliances sans marriage (“They don’t seem to want it,” observed Joan), the single mothers, etc. An everyone agreed that it is quite a change from Hollywood during its Golden Days. “Has anyone seen WANDA, which she directed?” asked Joan. “Nobody did it as well as Welles,” Joan commented succinctly. We spoke of the new Joe Losey film, THE GO-BETWEEN, with Alan Bates and Julie Christie, and of the superb performance of young Dominic Guard. ​I had found the flash-forward technique, the juxtaposition of present and future, confusing and irritating for a while and wondered if different editing couldn’t have made the use of it more comprehensible. What can young performers today do to endure in the industry? “Study. Never stop studying,” Joan responded. “Read out loud. Constantly examine the technique of other stars and top directors. ​I try to see all the films I can of a director before I work with him, familiarize myself with his technique and style. This can be invaluable help. What was it like working with John Barrymore in “GRAND HOTEL”? It was getting late and we all had dinner engagements, so we began our ‘adieus.’ “I wish Anita Loos could have come today. She’s so much a part of the movies, with her background. And we didn’t get to talk about Frank Capra’s new book. He directed me in practically my very first movie with Harry Langdon, who was so funny, I’d break up laughing every time I had a scene with him,” Joan said as she walked me to the door. It’s always that way when I see her the time flies by and I leave never having gotten around to all the things I planned to discuss. So, we phone each other later and try to finish the conversations. There goes the telephone now." Larry Carr is a music authority and author of the book FOUR FABULOUS FACES published earlier this year by Arlington House.